A 22-year-old Miramichi native is bringing the taste of Haiti back to Canada and is hoping to help restore Haiti's coffee industry to the prominence it once held. Robert Lehnert and two of his schoolmates have started Café Xaragua, selling Haitian coffee beans online and at a few locations across Canada, including Lehnert's hometown coffee shop, Books Inn. The beans, imported at fair trade from a coffee co-operative in south-eastern Haiti, have already been such a hit locally that Books Inn ran out of its first shipment in just a week-and-a-half. "We need more," owner Krishna Prince said with a laugh. "So we're waiting for him to bring us more." The combination of supporting both Haiti and a Miramichi-bred entrepreneur has helped grow the coffee's popularity, according to customers. "I saw Robby's picture, Robby's name, so I thought Robby's a neighbour, I should support Haiti and support the store and buy some good coffee," said Peter Gadd. "I'm not a connoisseur of coffee, but I enjoyed them," he said. 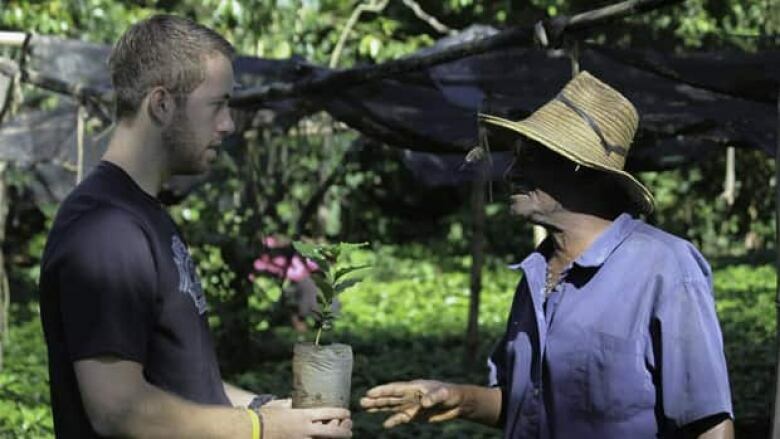 The company plans to start planting a coffee tree for each bag of coffee beans it sells (Courtesy of Café Xaragua)In addition, Lehnert's company plans to be socially responsible and will begin planting a coffee tree in Haiti for each bag of beans it sells. Only two per cent of the country's forests currently remain, Lehnert said. "To reforest with a crop such as coffee makes a lot of sense because not only are you reforesting the countryside, you're also providing an economic opportunity for the people there." 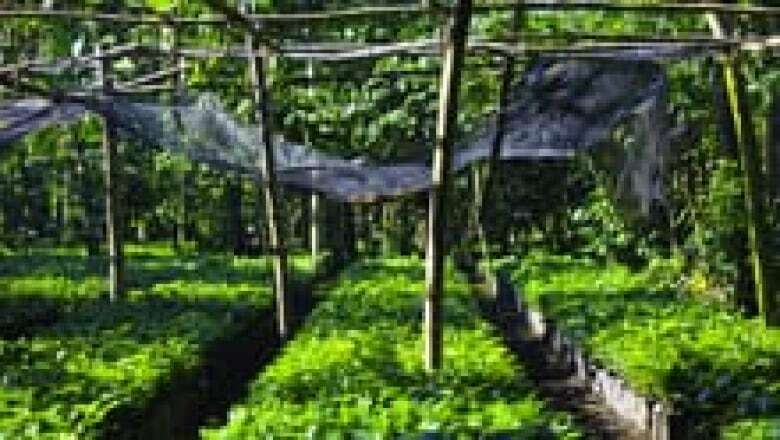 Whoever buys a bag of coffee will be able to track the growth of their tree online, Lehnert said. Once that tree reaches maturity, customers will be able to buy their coffee from it, giving each customer a connection to the rebuilding of Haiti's coffee industry, he said. In 1949, Haiti was about the third largest producer of coffee in the world, he said. But low prices and political instability eventually eroded the once thriving industry. Lehnert also expects to plant other vegetation, such as banana trees and plantains, to provide shade for the coffee trees. Lehnert went to Haiti in search of business opportunities last May with schoolmates Jordan Peckham and Scott Schneider, after he graduated with a business degree from the University of Western Ontario. "It's one of the poorest countries in the world…So business is clearly a way for them to move forward," said Lehnert, who had previously visited the Caribbean nation to work in a health clinic run by the charitable organization Haiti Village Health. The trio decided to invest in rebuilding the country's coffee industry, with Lehnert and Peckham as co-founders and Schneider as an investor. Coffee is the "second most traded commodity, next to oil," Lehnert explained. "There's a lot of money in coffee and it's an agricultural product that really creates something for the environment down in Haiti." They rented a pick-up truck, found a guide, and went in search of Haiti's best coffee beans, armed with old maps of where coffee used to be produced. "Eventually we ended up in south-east Haiti, where we found a very good quality coffee and that's where we based our operations since then," in Belle Anse, said Lehnert. COOPCAB, a farmers co-operative, represents about 4,000 farmers in the rural areas and helps them with processing and business dealings. 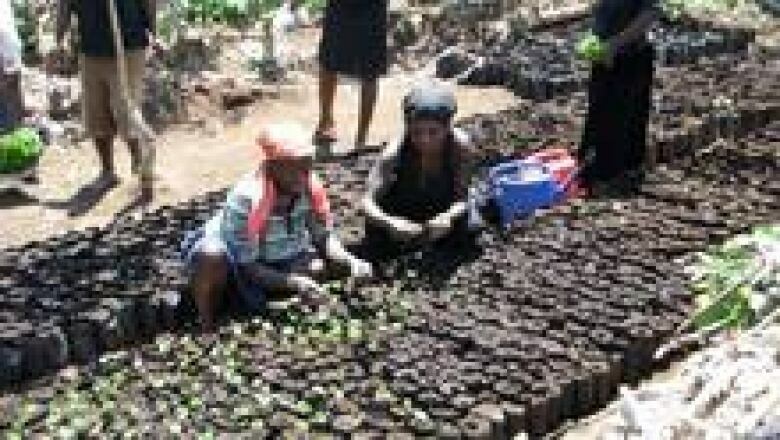 (Courtesy of Café Xaragua)The company Xaragua, whose name comes from one of the traditional tribal regions before Haiti was colonized, purchases the green, bean-like coffee seeds from COOPCAB, a farmers co-operative that represents about 4,000 farmers in the rural areas. COOPCAB helps the farmers, most of whom have small plantations, with the processing — taking the beans out of the cherries in the fields and sorting them by size and grade — as well as the business dealings. The coffee is then roasted and packaged by a company in London, Ont., where Lehnert is now based. "It's been a pretty interesting journey, to say the least," said Lehnert. "After you visit a country like that and you come back to Canada and you see the things we have here in Canada and you really see like how lucky we are here in Canada. You know you hear people complaining and you just, it's ridiculous really if you ask me. "I've had great parents, I've had great opportunities and I really think that, you know, you're in this life once, you might as well take advantage of those opportunities that you have and I think there is an opportunity to do something great down in Haiti, which is kind of my long-term vision for the company."